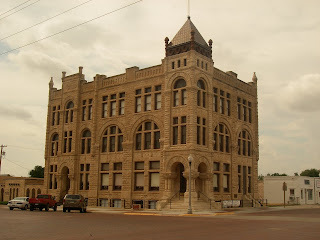 In Ness City the Ness County Bank Building (above) is billed as the Skyscraper of the Plains. It is a beautiful sandstone building with loads of architectural interest. Built in 1890 it is the pride of Ness City. We left Ness City with a helping wind from the southwest. 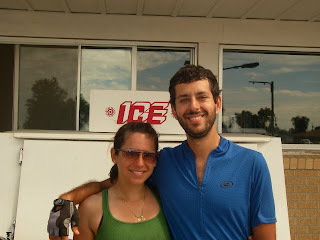 We fairly flew along for the first 33 miles to Rush Center on Hwy 96 averaging 13.6 mph. Along the way we visited with Gabby and Cesar again. They have been going at our pace and route for several days, but were going to deviate from the route today as Cesar needed to get to a bike shop for new tires. We stopped for lunch in Rush Center before turning South on Hwy. 183. Once going south we needed all our strength to ride into the gale that had increased while we were eating. For 19 miles we struggled. At one point we realized that we had never worked so hard to go 6 mph downhill before. Dave told Belinda that if he ever complained about our River Rd. headwinds at home again to remind him of this day. But this struggle eventually came to an end as once more we turned east on Hwy 156 and rolled into Larned where we made camp in a beautiful city park. 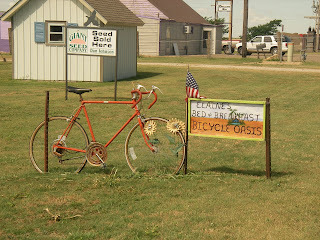 The next day we rode east out of Larned with a tailwind along Hwy 19 which eventually became County Road 484. It was a fast (ave. 13.0 mph) ride of 56 miles to Sterling. We once again camped in a beautiful city park where we swam and showered at the local pool for free. Yesterday, having an appointment for noon dinner at Ray's ancestral farm we didn't have time to ride, so Ray and Brenda packed us all up and we drove out to the farm to meet his nephews Rodney and Ryan and their families. Today we are camped at Spring Lake RV Campground (owned by one of Ray's boyhood friends) outside of Halstead. Ray and Brenda have just lefted to fetch Ray's brother, Leslie, for a BBQ. here at the campground. Hey John, no we didn't stay at Elaine's but I couldn't resist taking the picture of the sign for a bicycle oasis. I'm glad you had a good time at the festival, I told Greg in an e-mail that the music is one thing we really miss. Today we are going to do some sight seeing with Ray and Brenda and hit the road again tomorrow. We could have used the help with the headwind. However, we have it easy compared to the people heading west.